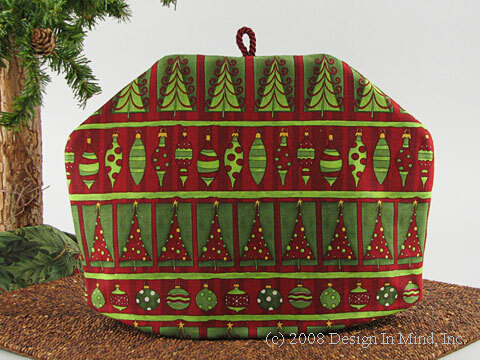 Tea cozies for holidays throughout the year. 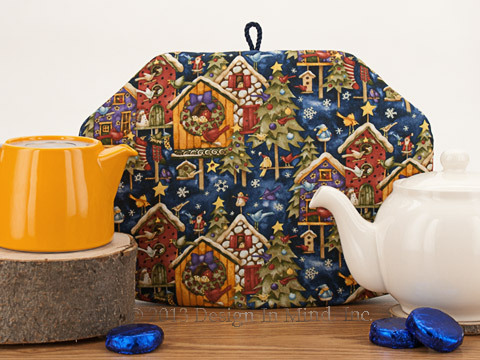 Tea cozies for holidays throughout the year. These cozies are made to order and will be shipped typically within 1 week after your order is received. See the "Quick Ship!" group for tea cosies available to ship now. 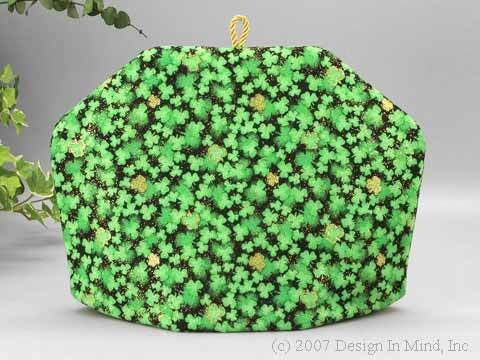 On this tea cozy, shamrocks in several shades of green dance into the distance of a sparkling, starlit night. Quilter's cotton. 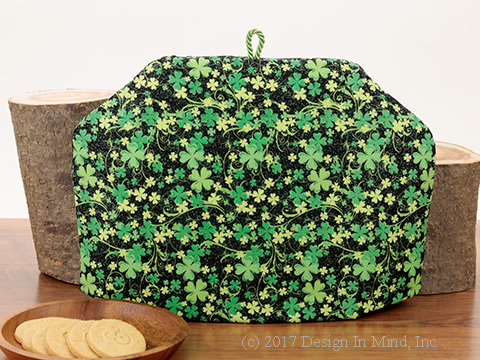 A shower of bright green shamrocks are falling in front of a vibrant rainbow, accented by a fine mist of metallic silver on this quilter's cotton tea cozy. 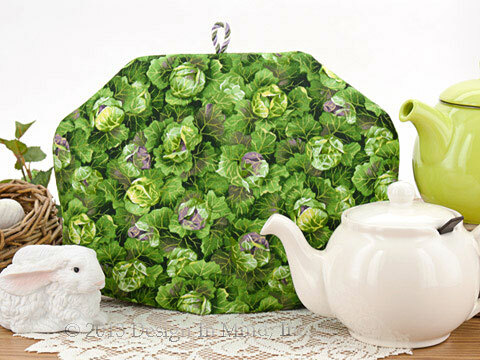 Perfect for your St. Patrick's Day pot of tea! 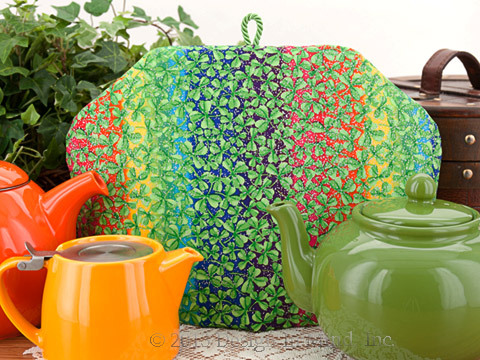 Shown with Curve teapot in carrot, Stump teapot in mandarin and Brown Betty teapot in leaf green. 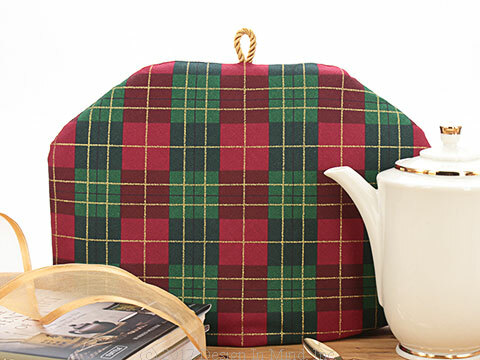 This is the perfect tea cozy to wish a loved one a Happy St. Patrick's Day. 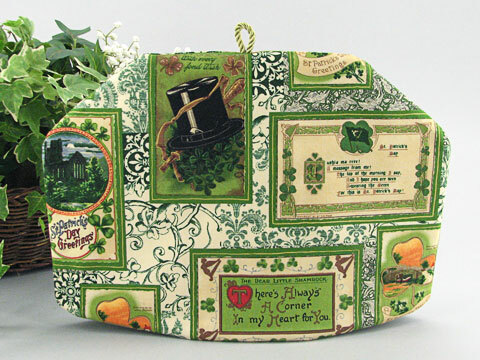 Framed images of a top hat, castle, and Shamrocks galore capture a warm Irish Blessing. The fabric background looks antique-like on a cream quilters cotton base. Bright green three-leaf clovers on a black quilter's cotton with metallic gold accents. 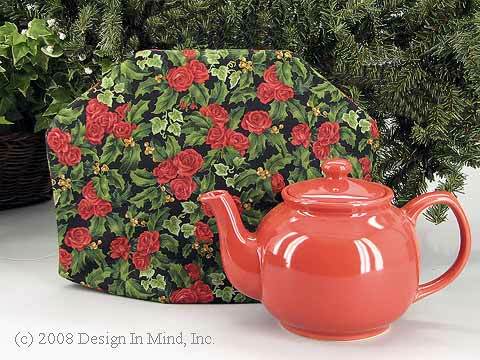 Small roses dot this Valentine themed tea cozy. The cover is made of deep red quilters cotton fabric with packed 1/2" roses. Add real roses and a nice cuppa tea to celebrate your loved one! 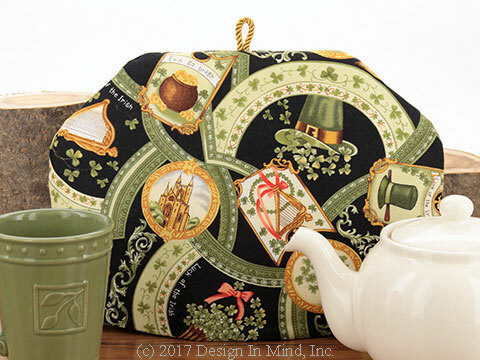 Shamrocks, gold, castles, harps and Leprechaun's hats in green, gold, soft white, brown and black celebrate Ireland on this quilter's cotton tea cozy. Shown with Chatsford teapot in cream and Sorento mug in green. 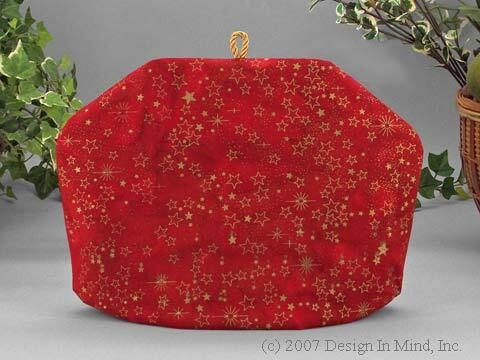 Just in time for the holidays is this limited edition tea cozy in warm shades of cranberry and pine, with metallic gold accents. Quilter's cotton. 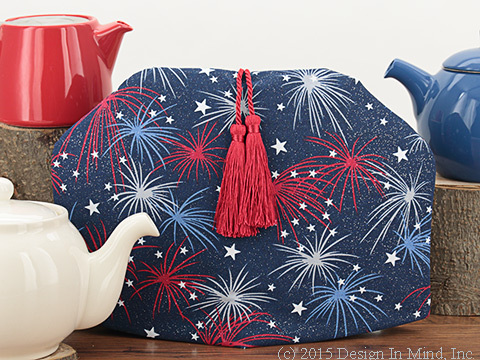 White stars, fireworks in red, blue and soft grey and a fine metallic silver shimmer cover the deep blue sky on this tea cozy. 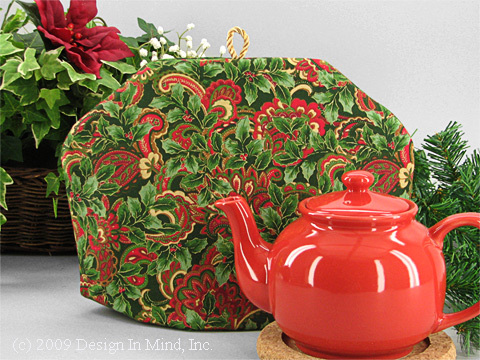 Shown with stump teapot in red, curve teapot in marine and chatsford cream teapot. Quilters cotton. 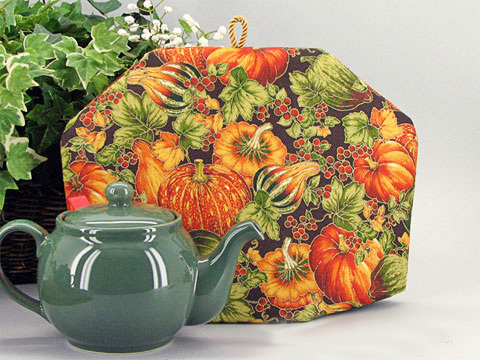 Scenes of a plentiful harvest cover this tea cozy in warm autumnal shades of pumpkin, cranberry, brown and cream on a variegated green background. Quilter's cotton. Shown with the Chatsford teapot in cream. 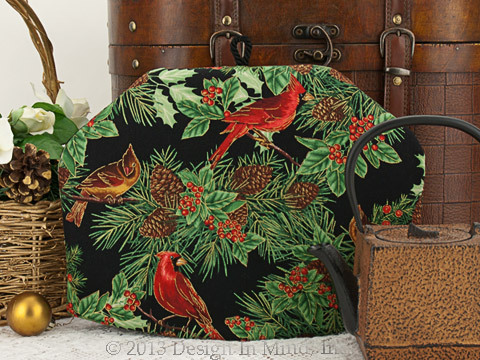 Pairs of vibrant cardinals rest amid pine boughs and red berries, highlighted with metallic gold on a black background. Shades of cranberry, brown and pine green. Shown with Harmony cast iron teapot. 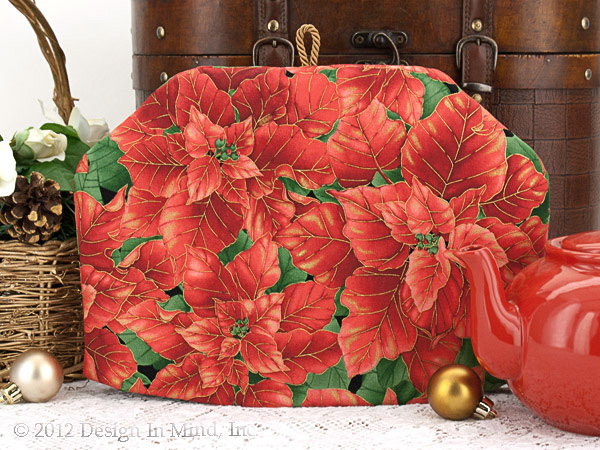 Poinsettias in shades of cream and tan, dark red berries, brown pine cones and cool green leaves and pine sprigs delicately highlighted with metallic gold cover a black background. Shown with our Chatsford teapot in cream. 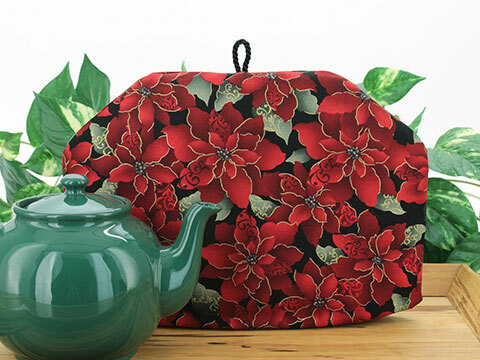 A profusion of painterly red poinsettias with green leaves cover this festive tea cozy. Metallic gold highlights on a black backgrounded quilters weight cotton. 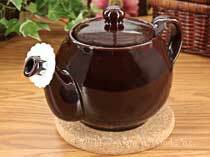 Shown with our 'Brown Betty' teapot in cherry red. 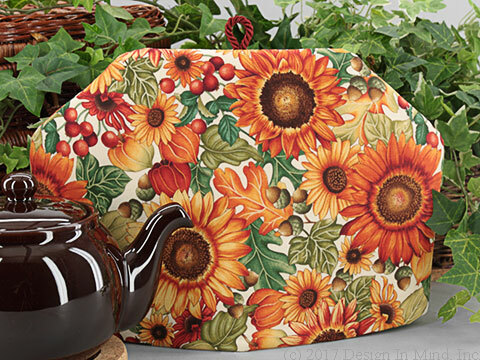 Pumpkins, pears, apples, grapes, flowers and leaves in gold, bronze, burgundy and green cover this fall harvest inspired tea cozy. All are edged in metallic gold. Quilters cotton fabric. 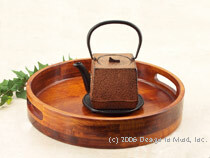 Shown with the ForLife Curve teapot in mandarin. 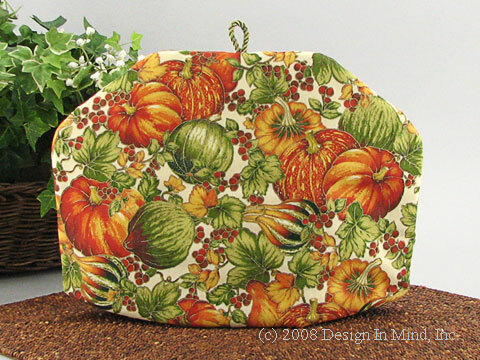 Sunflowers and leaves in harvest colors surrounded with red berries, and acorns on a cream colored quilters cotton fabric. 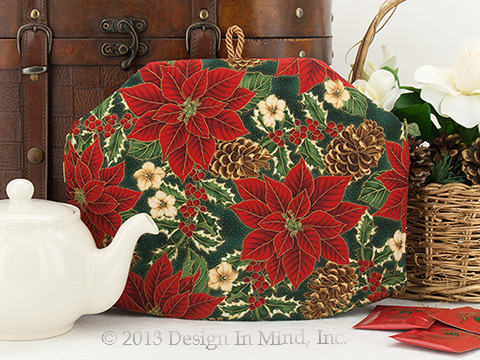 This elegant holiday tea cozy features red poinsettias, holly with red berries, two-toned pine cones, all on a deep green background. Edged in metallic gold and finished with a loop. Quilters cotton fabric. 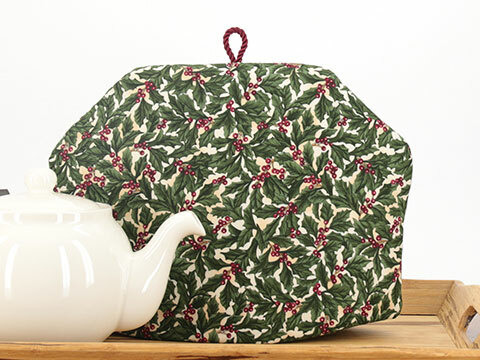 This tea cozy is a contemporary design of two toned holly leaves and red berries on a mottled burgundy quilters cotton. 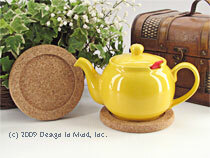 Our newest tea cozy for your valentine tea! 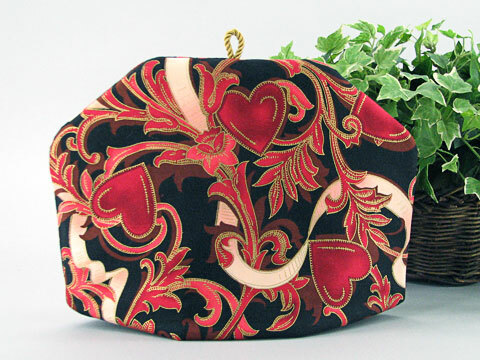 Rich tonal red hearts are accented by metallic gold and sit on a ribbon and leaf vine. The background fabric is a black quilters cotton with brown shadows. A red vine and flower swirls to tie the the tattoo-like image together. 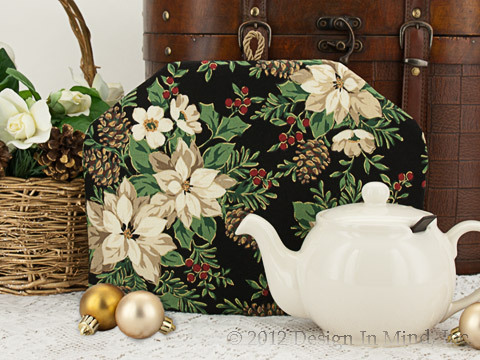 This antique looking tea cozy features large poinsettias, gold and burgundy ribbons, and holly with berries...all outlined with metallic gold. Background is a light gold quilters cotton. 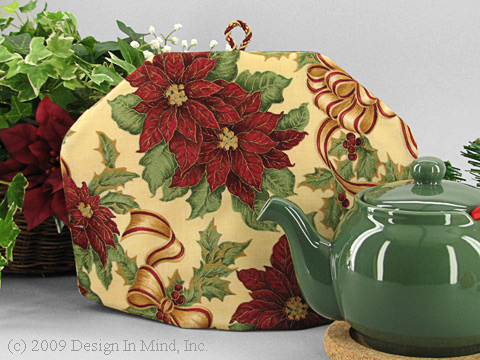 This tea cozy title says it all: Holly leaves with berries intertwined with a wonderful paisley design in greens, reds, a touch of brown and light gold. Holly leaves outlined in metallic gold. Fabric is a quilters cotton. Tea Cozy - Be Mine! Artistic pink & white hearts, and some that look like chocolate, sit on a red quilters cotton tea cozy. 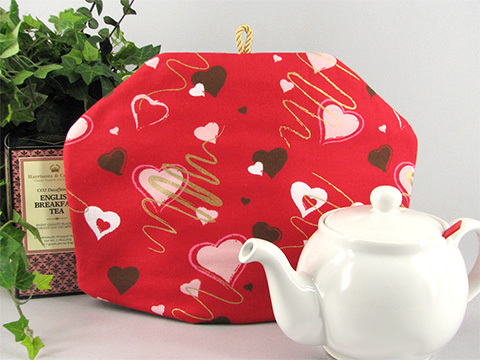 Gold metalic swashes add just the right embellishment to this Valentine's Day tea cozy. Teapot and tea sold separately. 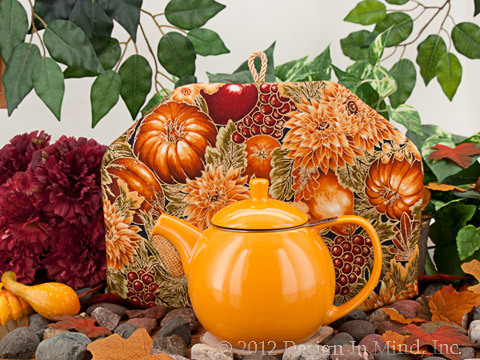 Another beautiful tea cozy for your Thanksgiving or fall harvest tea table. Identical to Harvest Bounty, but with a cream background. Orange, gold, yellow, burgundy & varigated green harvest vegetables. 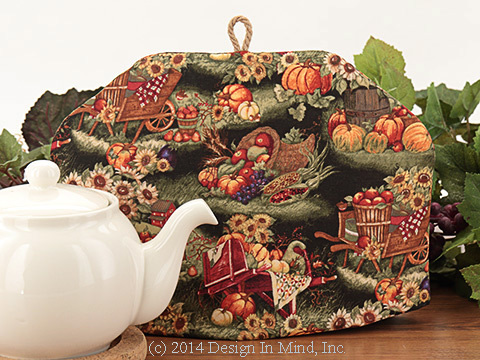 This tea cozy would be a beautiful addition to your Thanksgiving or fall harvest tea table. The fabric is a brown quilters cotton with orange, gold, yellow, burgundy & varigated greens. A 4th of July tea cozy. 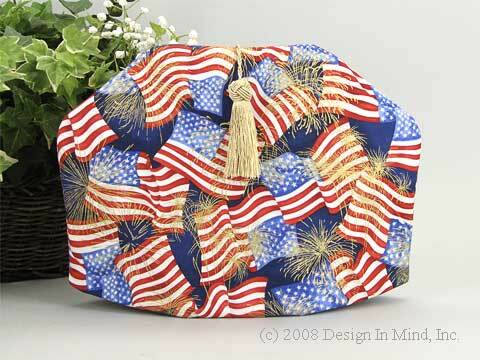 Fireworks and flags abound in all the traditional colors with a hint of sparkle on a quilters cotton fabric. 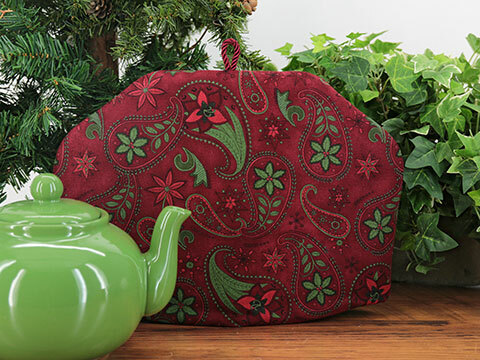 This beautiful holly and rose tea cozy will grace your holiday table in style...quilter's cotton, red, green & gold on black. 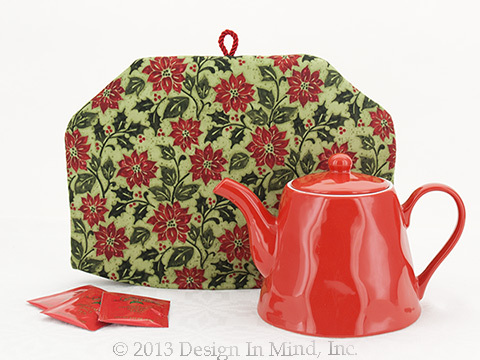 This holiday tea cozy is a great mix of color & style. 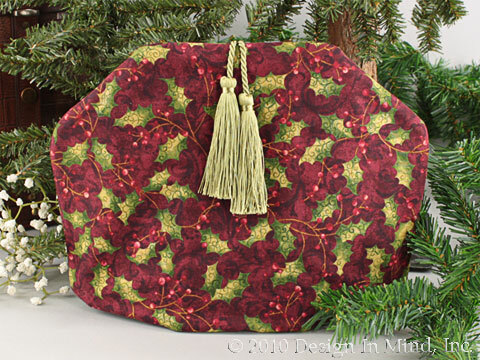 The casual paisley pattern in dark green sits on a deep burgundy/cranberry background. A great contemporary addition to Christmas tea. Metallic gold stars and rays on a red color washed quilter's cotton. Gold gilded and brightly painted Easter eggs in yellow blue pink and purple on a violet navy cotton decorator print.